PRICE JUST REDUCED- Many unique,authentic,originally furnished options. Second owner delivered to Irwin Marine and never left Lake Winnipesaukee. It has maybe 3 hours on its new bottom/ribs since 2005 and 10 hours use since 1997. All chrome has been refinished by D&S who do all my collector cars. Steering wheel also refinished for third place award in ACBS Lake Winnipesaukee competition. Awards also. 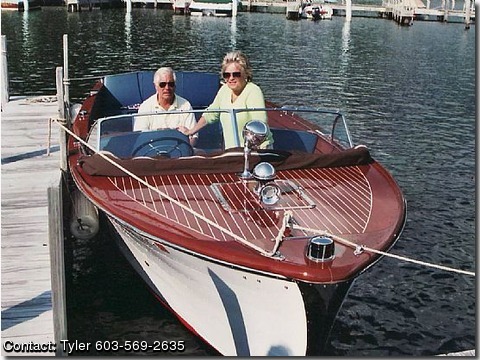 1948 22' Chris Craft Sportsman Deluxe.Hull U-22-1142.ACBS Award Winner. Near perfect example of the classic Sportsman built and sold in 1948. This boat used for family outings and shows only. never skied. Newly double planked full mahogany bottom, stern, transom, white oak ribs prof rebuilt by Ivan Phelps' Wooden Boat shop. Fresh 4 coat Eplfanes varnish white hull and correct Petit Copper Bronze bottom and Boot stripe professionally prepared and painted by Vintage Race Boat Shop. Motor, carbs, electrics and transmission examined, adjusted by Boat Engine Master Mechanic Jim Kondrat. Boat exceptionally idles down to 300rpm. reliably tops 30mph, Immaculate correct interior upholstery Medium blue tolex.